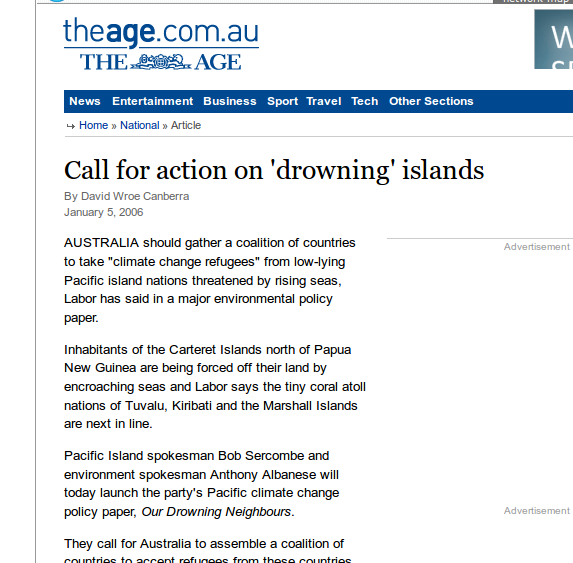 On January 5th 2006 the then Federal Labor MP Bob Sercombe and current MP Anthony Albanese issued Our Drowning Neighbours, Labor’s Policy Discussion Paper on Climate Change in the Pacific, with the goal of generating a more proactive, strategic approach. Context: The Association of Small Island States was formed in 1990 at the second World Climate Conference in Geneva. Various nations had already spotted that sea level rise was going to be a bit of a problem for them. Initially (in the late 80s and early 90s) it looked like Australia and New Zealand were going to be responsible hegemons. But that optimism faded before John Howard became Australian Prime Minister in 1996 (see Jeremy Leggett’s “The Carbon War”, page 166-7 for an example of this). And during the brief Labor interregnum of 2007 to 2013, coal exports from Australia were not discussed. Which leads to protests like these.